1. The diversity of people I meet every time I visit. I am always able to strike up a conversation while “gravy” is dripping and dribbling down my chin and elbows. It doesn’t matter whether you are white collar, blue collar or red neck or were shod with pumps, boots, high heels, or athletic shoes. 2. I always see some of the same employees every time I have eaten there over the past few years. Great Neighborhood Restaurants keep their employees. 3. Al’s is passionately loved by its patrons and supporters. Just as Johnnie’s, or Mr. Beef. Reminds me of the passionate rivalry between Cheers “Where Everybody Knows Your Name” and Gary’s “Olde Town Tavern”. Cheer’s and Gary’s were Reality TV before Reality TV became insipid. 4. Mario’s Italian Ice is across the street. Enough said! 5. While researching this post Al’s is tossed out in a variety of threads and topics unrelated to Italian Beef. Pilsen/UIC/United Center – inexpensive dinner? If you had 10 bucks…. What’s the Best Sandwich in Chicago? Love it or hate it, I've got to agree that Al's deserves the plaque. Having had the pleasure of your company while you delicately consumed (read ate like a rabid wolf) an Al's or three I can attest to the fact you very much enjoy Al's. Al's is a terrific nomination. I'm was, am, and remain a loyal fan of Al's. Love the beef, love the giardiniera, love the fact they twice fry the french fries, love the fact they use real charcoal to cook the Italian sausage, love the atmosphere, love the fact they are across the street from Mario's Italian Ice and just generally love the place. In case you can't tell, I am 100% for renewal!! I know Al's is a favorite of many but, I for one, have never been impressed during any of my visits. It is my feeling that Al's is existing on a previously earned reputation and is not putting out a product or atmosphere worthy of renewal. 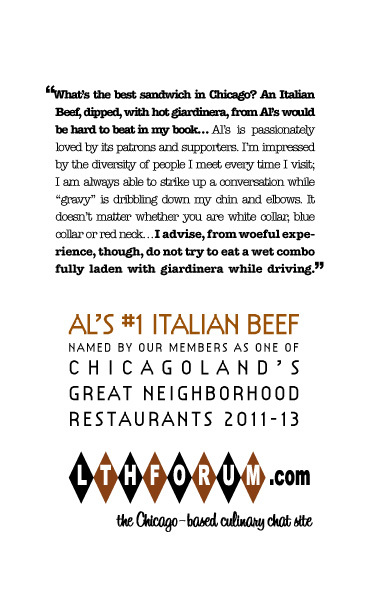 Al's is not my favorite beef in town, but there are many who swear by it. About the only time I go to Al's is when someone else wants to try it. The place is a classic, though and is more than deserving of renewal. I am assuming we are talking about the original Al's on Taylor only. The Ontario location occasionally will serve up a good sandwich, but the franchised locations are barely worthy of being mentioned in the same sentance as the words Italian Beef. I'm definitely in favor of renewing Al's as a GNR, I continue to grab an IB and Fries every chance I get. My wife and I got to Chicago a little early for the Christmas party. I took her to Al's and we split an order of fries and she loved them. I got a to go package for the next day which we enjoyed. Same great food, same great atmosphere, same great service. What more can a GNR do! stevez wrote: I am assuming we are talking about the original Al's on Taylor only. That is certainly my understanding. Al's on Taylor only. How do we make that distinction obvious? The one here in Evanston is undistinguished, to say the least. Just another vote in favor of renewal. Al's beef is incredible. The fries are among the best in the city. My first taste of italian beef was Johnny's three years ago when I moved here. I quickly embraced the Official Sandwich of Chicago and have tried beefs all over the city. Al's is my favorite. The sandwich is incredible- tender beef with the soaked bun, a tasty gardineira that is cut smaller but still spicy, and a couple of lovingly-grilled sweet pepper strips that bring the whole thing together. All my life I have HATED these peppers - except on an Al's Italian Beef. Rereading the original nomination, I do not see how one could conclude that it covers any other location. But these posts also seem to confirm that, and I suppose I might edit Bruce's nomination to say "Taylor Street location only, and not any of the other (franchised) locations, whose quality can be variable." Assuming it is renewed. I have said it before, but it bears repeating. Unique sandwich, not my favorite, but reliably very good and it deserves points for daring to be unique (though I still think the Patio is working to copy it). Great atmosphere, late hours. I stop there whenever I am in the 'hood. Last edited by dicksond on March 30th, 2007, 3:55 pm, edited 1 time in total. I suppose I moght edit Bruce's nomination to say "Taylor Street location only, and not any of the other (franchised) locations, whose quality can be variable." Absolutely. On the way to Gary's years ago, it was Sunday, I decided to by the Al's on Taylor. Closed I went to some other location, and what a mistake. Al's on Taylor only for me. Al's continues to make a beef sandwich that is unique and one where those unique components meld into a harmonious and wonderful whole. Then there are the grilled sausages. There are cheaper places, and even a couple that I like better, but I stop at Al's when I can and have never had a less than great sandwich. I know there are those who just dislike the different herbs in the beef and gravy. I even understand that, though they are completely wrong. Al's is not everyone's cup of tea (or gravy as the case may be) but then a proper GNR usually isn't and probably shouldn't be. The herbs they use in the beef and the juice actually happen to be my favorite but I do understand why they are not so for everyone. Even so, I think it would be difficult to make the case that Al's is not both great in it's own right and a place truly unique to the neighborhood. Last edited by Stagger on February 18th, 2009, 7:14 pm, edited 1 time in total. Stagger wrote: Al's is not everyone's cup of tea (or gravy as the case may be) but then a proper GNR usually isn't and probably shouldn't be. The herbs they use in the beef and the juice actually happen to be my favorite but I do understand why they are not so for everyone. Even so, I think it would be difficult to make the case that Al's is not both great in it's own right and a truly place unique to the neighborhood. In fact, I'm one of those for whom it's not my thing. I know it has its critics but for me, Al's is the best. It's the beef I grew up on and it's the beef that scratches the itch. I've gone through several alternating phases -- beef, sausage, combo -- I've loved them all. And more often than not, their fries represent all that is holy. When I used to live out of town, an IB from Al's (dipped with hot) was the thing I craved most when I was away and it was the first food destination I'd hit when I'd return. When visitors come, it's the place I want to take them, and they almost always end up becoming fans, too. As this thread highlights, even those who aren't necessarily fans of Al's generally appreciate what they do, turning out distinctive, consistent product. It's a gritty Chicago institution, an important part of our culinary landscape and a GNR for sure. ronnie_suburban wrote: I know it has its critics but for me, Al's is the best. When I read this "me too" ran through my head. I know, Pop's, Chickie's, Johnnie's seem the aficionado's choice, but if pressed Al's on Taylor would be my clear pick. Still the absolute gold-standard for Beefs. A GNR's GNR. I have been going to Al's off and on for more than 35 years. Over the decades, the bread has changed for the worse, but the beef still has that rich super-beefy flavor I remember as a kid. I do make a point of stopping there whenever I am in the area. In fact, I got a beef to go from there just the other day. While the beef still had that almost carmelized, roasting pan flavor that comes from hours of slow cooking, the bread (standard Gonella) lacked the chewy jaw-straining texture I remember as a kid. Still, the beef had that big flavor that is so hard to find in the gray mush that most places pass off these days. I had a big problem with the fries though, although they were whole cut, they tasted as if they had been fried along with old dog-food cans. No kidding, they were totally inedible, and cost nearly $2 to boot. The total tab for a large beef, fries and a watery coke was $13.48, a far cry from when I used to get the same for about a buck at Al's. At any rate, I still give Al's a big thumbs up for the beef itself, but the bread was just OK and the fries totally sucked. Al's Beef certainly is not the value it once was (but then again what is?). Still, I will be back, probably just not as often. As far as GNR status goes, I believe Als still deserves it, but someone really needs to replace the oil and possibly the grates at the bottom of the fryers. Al's gets a yes if only because they're a quick drive from home and open late (midnight on the weekends, 11 on weekdays), so it's a good last-minute meal if I'm on my own for dinner. Very few places speak to me (in Italian) like Al's and Mario's. Iconic Chicago mainstays even if you don't have giardinara in your blood as I do. To me, nothing says Chicago more so than the Taylor St. combo above. I know the world of Italian Beef in Chicago can be polarizing at times but if I could only choose one, it'd be Al's on Taylor. I crave it and could eat it once a week or more. Unfortunately (or maybe, fortunately ), it's too far from home for that. In any event, I support renewal. Agreeing with Ronnie, again. This is my favorite beef, due to the touch of garlic. Yes, please renew Al's. To me, the definitive beef that evokes Chicago. My father and brother started taking me around 1960- pre circle, when it was inside (on the other side where the prep kitchen is now) staffed by Italian mamas from the hood w/the giardinara self serve on the counter. A beef was 60 cents, a combo 75. Took my high school mktg class on a field trip to Maxwell St followed by Al's. Can't think of much that makes me happier than a combo, dipped w/sweet and hot and a Mario's extra lg peach. A truly great beef, as excellent as it is unique in seasoning and how it is cut (almost shredded). I make my regular pilgrimages to Al's and have yet to be disappointed.